Wispy tendrils of hot dust and gas glow brightly in this ultraviolet image of the Cygnus Loop Nebula, taken by NASA’s Galaxy Evolution Explorer. A spectacular photo from a NASA telescope has revealed a wispy blue nebula with an odd twist: It looks like a giant human head in deep space. 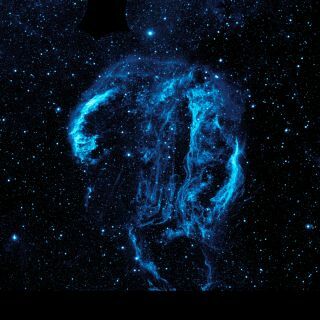 The head-in-space nebula photo was snapped by NASA's Galaxy Evolution Explorer satellite and shows an ultraviolet view of the so-called Cygnus Loop nebula, which is located 1,500 light-years from Earth in the constellation Cygnus, the Swan. It was released March 22 and featured this week on NASA's website. What makes the new Cygnus Loop image striking is its odd shape. The nebula looks like a giant human head and neck, which appear in profile facing the left of the image. A bright star serves as an eye while wispy nebula gas traces the outline of jaw, and close-cropped hair. To be clear, the Cygnus Loop nebula head is an optical illusion, one of many caused when observers see familiar patterns in images. Recent examples of space illusions include images of the so-called Fried Egg nebula and Running Chicken nebula. The Cygnus Loop nebula is all that remains from a colossal star explosion that occurred between 5,000 and 8,000 years ago. "The filaments of gas and dust visible here in ultraviolet light were heated by the shockwave from the supernova, which is still spreading outward from the original explosion," NASA explained in a photo description. "The original supernova would have been bright enough to be seen clearly from Earth with the naked eye." The nebula covers an area of the night sky that is more than three times the size of the full moon and is tucked beneath one of the wings of the imaginary swan that makes up the Cygnus constellation. NASA's Galaxy Evolution Explorer, which took the Cygnus Loop nebula photo, was launched in April 2003 on a mission to map vast areas of the sky in the ultraviolet range of the light spectrum. The spacecraft completed its primary mission in 2007 and was placed in standby mode as engineers prepare to shut it down for good later this year.